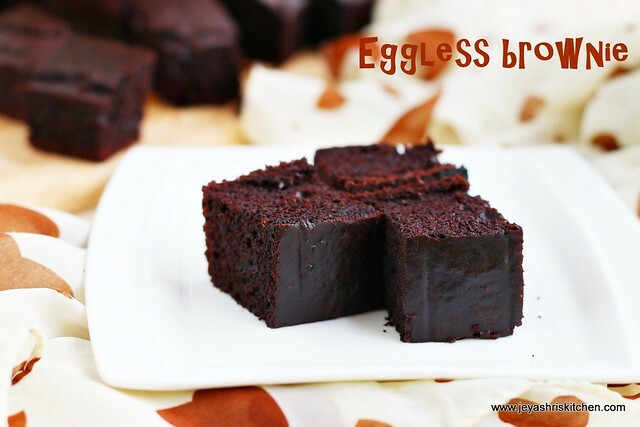 Eggless chocolate brownie, i have tried this recipe quite a lot of times and every time it is a super hit. Few months back when i did a cookery show in a nearby community center, i made this eggless chocolate brownie along with the hara bhara pulao and potato halwa. All the recipes were super hit in the show. I have adapted the recipe for chocolate brownie from nag's space. 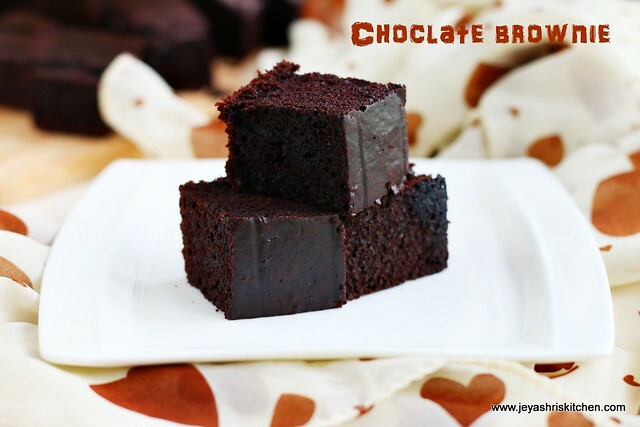 This brownie was super hit among my kids and their friends too. The color of the brownie depends on the brand of cocoa powder. This time i used the bake king brand and it turned out bit dark. Check out my other eggless baking recipes. As today is Varsha's birthday, i thought today i will post this brownie recipe. Update : You can bake this in the pressure cooker too. Check this link and follow the instructions. In a bowl add the milk and lemon juice and keep it aside. Add the flour, cocoa powder and baking soda in a bowl . Add this to the flour mixture and mix well. Add oil and vanilla essence to the milk mixture. Make a dent in the flour mixture and add the wet ingredients. Gently mix this in a circular motion and pour it over a greased baking tray. Preheat the oven at 160 degrees for 5 minutes. Place it in the oven and bake it for 25 minutes or insert a skewer|toothpick in the center of the cake and if it comes out clean, the brownie is perfectly baked. When it is completely cool, cut this into squares and enjoy the brownies. It tastes best when served with vanilla ice cream. You can add a handful of walnuts on the top of the batter before baking. Lemon juice and milk can be replaced with buttermilk. Hi. Is there any alternative for maida. We can made it in the pressure cooker also? When using a convection microwave oven in what mode should I bake a brownie.any idea about it? You have just written an amazing article over eggless chocolate brownie and as a food bloggers i appreciate your work. Thanks for sharing great article. Can we use baking powder instead? If what proportion.